Construction Management and General Construction firm serving the Philadelphia region for over 65 years. A third-generation masonry construction and restoration company specializing in new building construction, maintenance, dismantlement, reconstruction, and preservation of buildings for a national clientele. 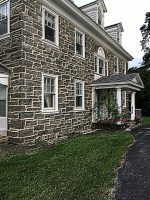 Incorporated in August 2008, Mara Restoration is a full-service masonry restoration and preservation contractor, specializing in commercial and historic properties. Palmer Masonry Restoration specializes in restoring brick and stone structures as well as waterproofing and structural repairs.